Photo: Sgt Steve Blake RLC . 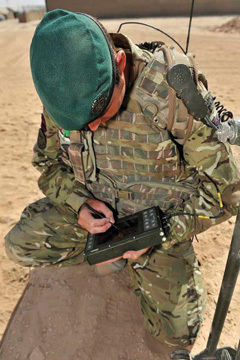 Royal Engineer uses Makefast Equipment. Lt Colonel Ian Blower was the desk officer for FRES. He has done simulation and modelling, and various other bits and pieces at regimental level. Most recently, just before his current assignment, he spent 9 months in Afghanistan. Q: So briefly, what is the LE TacCIS Programme and where is it in terms of implementation? A: LE TacCIS is the name of the programme today. We are going to change the name of the programme, eventually to Battlefield Tactical CIS Delivery Team. As that name implies the programme will cover all aspects of tactical Communications and Information Systems (CIS). Currently our in-service equipment comes from Bowman. Bowman has been around for some time now and the change from Clansman to Bowman was a huge change. We’ve used it now for some time, and actually we now know that the voice system wasn’t good enough. We want to change things. We want to do things differently. Q: Not good enough how? A: The current system is out of date. The radios are out of date. I’ll give you an example, now this is no criticism of the manufacturer, but the existing infantry radio, the 354 is a big, heavy radio. The battery doesn’t last a very long time, the range isn’t particularly good. It was state-of-the art when it was introduced, but now its 15 years old, and as you know, in CIS technology, that’s a lifetime! Q: I see, but even so, LE TacCis is not an immediate replacement. When will we see adoption, and what can we expect to be phased in to that point? A: Well, we’re talking about LE TacCIS going into service in or around 2018, between now and then there will be the assessment phase, we are very serious about that. We’re going to do an assessment now for a capability that has a half-life of about 18 months, so every 18 months we introduce a new version, and we’re going to study that for 5 years, and then we’re going to bring it into service and we want to keep that radio in service for 20 years. Well that’s how we used to do it. Now we’ve changed because we actually know that life moves faster than that and that technology moves faster than that. So what we want to do is introduce these into service much quicker. Q: Someone once said you go to war not with the army you want, but the army you have, would you say the same is true for CIS? A: The problem for us is that we have champagne tastes, but we have beer money. We can’t afford everything we want, so we have to work out what we are going to spend it on. Of course, as we’ve gone through this we’ve realised that we are no longer a standardised system. But now, it’s all about sharing voice and data. Whatever we do moving forward, if you have an email, chat, voicemail, whatever it is, you need to be able to connect it to somebody else. And the final bit on this one, when we’ve said we wanted to do something different, we do want to do something different, so you know daily we get more requirements appearing. More and more people say that they want something from the Programme. Q: It certainly all seems a tall order. So with all you have said in mind, where is the Programme really right now? A: So in terms of where we are, we’re right at the beginning of the assessment phase. The initial order came a few weeks ago, we are still having discussions to persuade people why it’s a better idea to do things a bit differently. The customer questionnaire went out over the summer of 2013, when we started sending things out, but in essence we have two parts of the assessment phase, the first bit AP1 and the second one AP2. AP1 is all about deciding what we are going to do. Are we going to take the current system and just keep evolving it? Or are we going to start again from scratch? Everyone talks about “interoperability.” We can do interoperability. Unfortunately we can’t do interoperability with the core radios that we’ve got because we have UK radios with UK spec that don’t work with anyone else. We don’t actually know what it means for the future either. The way the UK forces have been structured basically, we have our regular forces and our reserve forces, the reserve forces need to be able to operate with the rest of the force. So when you mix your proactive and your reactive forces they need to be able to work. The point is this, in the terms of the way the programme is working, we’re not going to create a 10,000 man new idea. We’re not going to come out and say “I want one of these and I want it to behave this way and be this size, etc.” What we’re going to do is we’re going to come to the fellows in the industry and say “Look, this is what our user requirements look like, can we see what you’ve got?” Now does that mean all COTS? No, because actually what we might say is well, nobody’s got something that kind of fits it, so we might want to bespoke a bit of it. That’s the sort of option that we’re looking at. What then happens is we’re not going to procure it the way we procured the old system. Q: So what are the greatest challenges remaining to Tactical CIS as you see them? Molecular Structure of Carbon Nanotubes.